Japanese comedians and celebrities have begun debating the merit of altering the Japanese pacifist constitution forcing ruling LDP members to reconsider their career choices with PM Shinzo Abe and other cabinet members turning to stand up comedy. The LDP is confident of a smooth transition having already attracted laughs with their recent policies, but are wary they may have used their best material too early – including the side-splitting jokes “enabling war will create more peace” and “nuclear reactors are safer now than they were before the 2011 Tohoku earthquake and tsunami”. “It is regrettable that we let out some rippers before the transition to stand up comedy but I think we can salvage something from these gags,” Shinzo Abe announced. Abe is planning to team up with Finance Minister Taro Aso to form a comedy duo naming themselves “The Two Arrows (One short of a 3-pack)”. 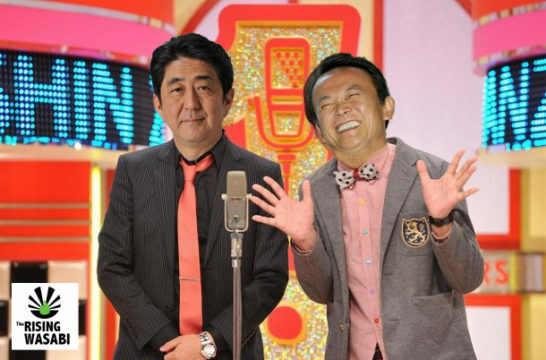 The new comedy duo will aim to emulate comedians Tsurube Shofukute and Hitoshi Matsumoto, and the SMAP boy-band celebrity Masahiro Nakai, who are now taking over the government’s job of facilitating debate of important national legislation.